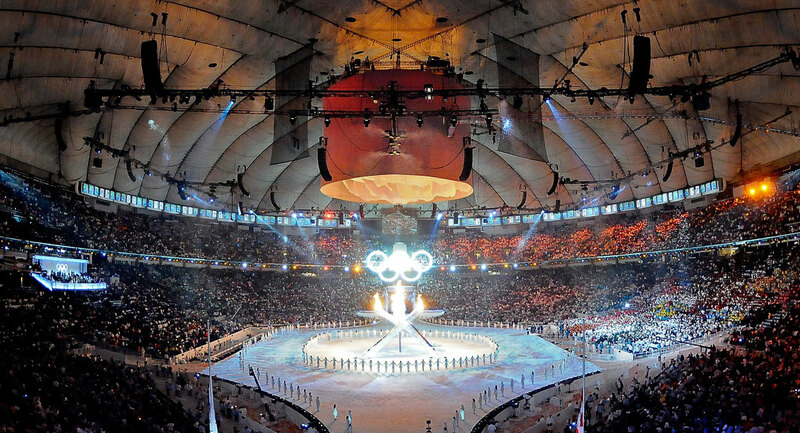 The elaborate Opening Ceremony of the 2010 Winter Olympic Games in Vancouver on February 12 was a profoundly beautiful celebration of the diversity of Canadian culture and the incredible landscape that provides the background to our lives. 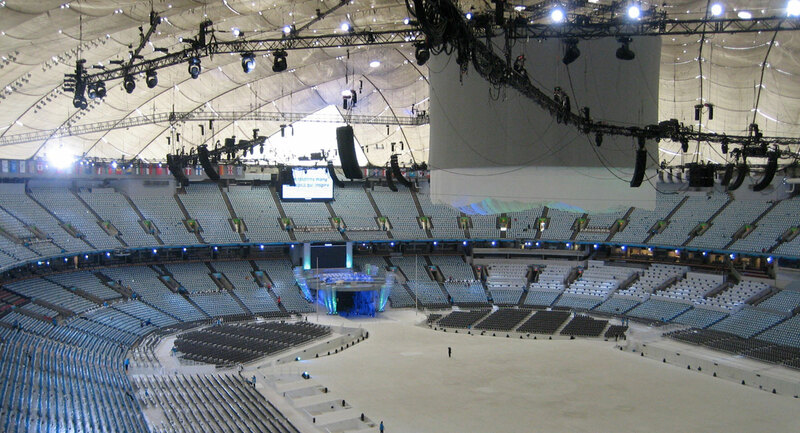 Lighting and projections were employed in place of scenery to dress the enormous stage in the 65,OOO-seat bowl of BC Place where the opening ceremonies were held indoors for the first time in the history of the Olympics. BC Place featured the largest air-supported stadium roof in North America. Executive producer David Atkins and his design team were presented with an unprecedented opportunity to stretch the boundaries of spectacle using state-of-art lighting, projection, sound, and special effects. The Teflon roof presented almost insurmountable challenges in rigging, projection, and sound reinforcement, and was sensitive to changes in barometric pressure, temperature, and wind conditions that caused it to rise and fall 4’ continuously during the course of the ceremonies. 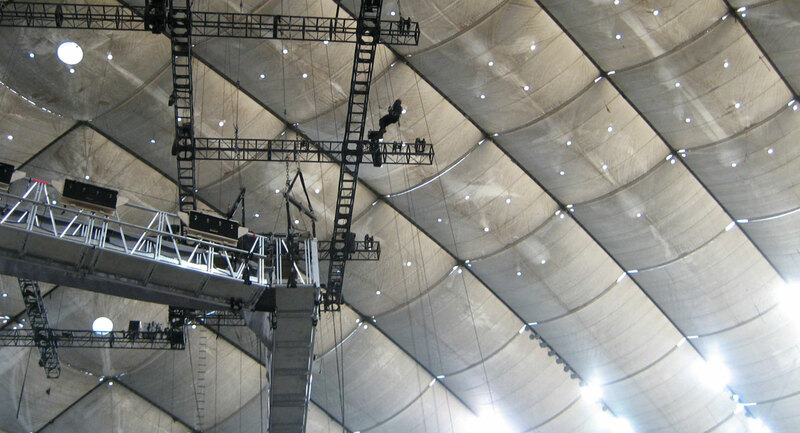 Furthermore, it limited the total hang in the stadium to 150 tons. 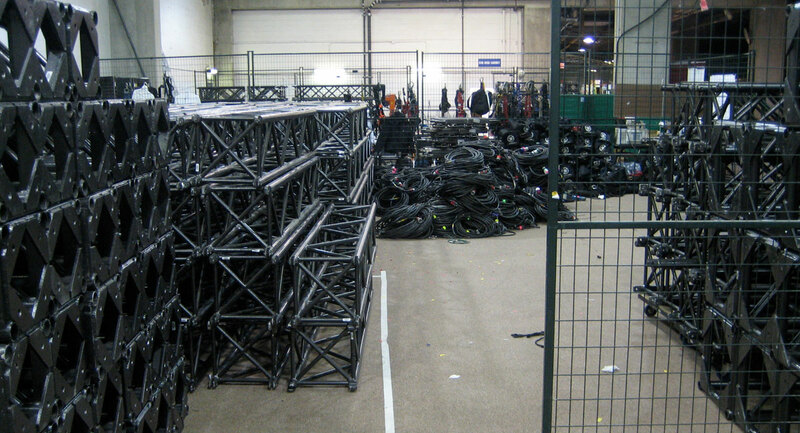 Riggit Services was handed the technical nightmare of engineering the rigging. 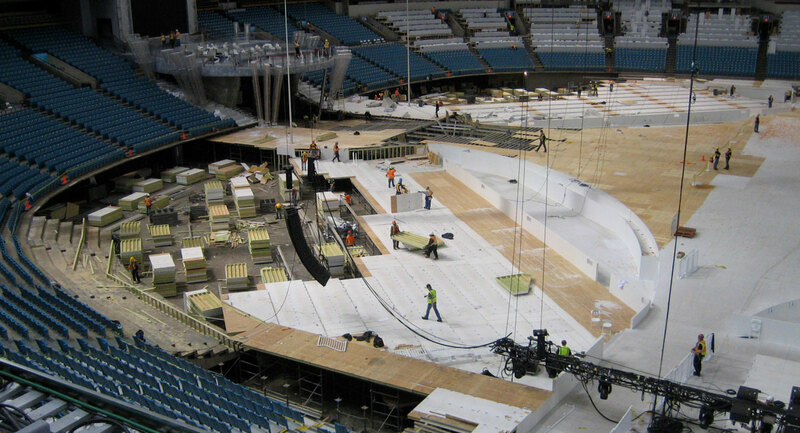 Riggit Services worked extensively with David Atkins Enterprises during the year prior to the games to create rigging designs that would make his vision for the Opening and Closing Ceremonies possible. 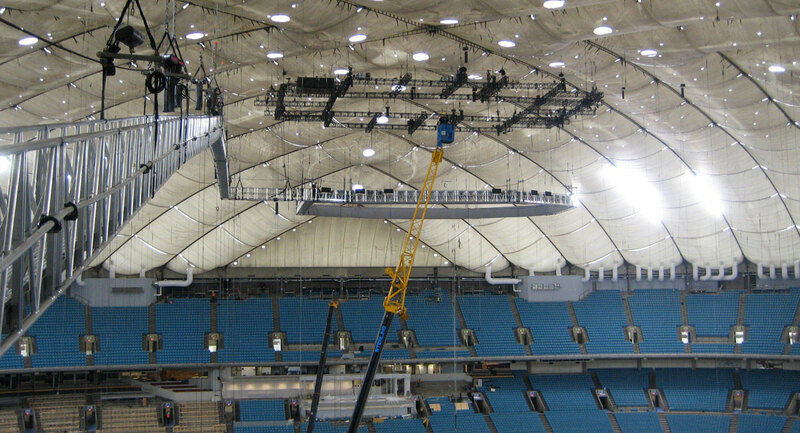 The continuous motion of the roof and its limited load bearing capacity required great care about where the rigging points were and how we articulated the entire rig in order to get where we needed to be. The motion also caused nightmares in focusing so all of the flown elements, and their relationships to the projection and the lighting, had to be encoded. 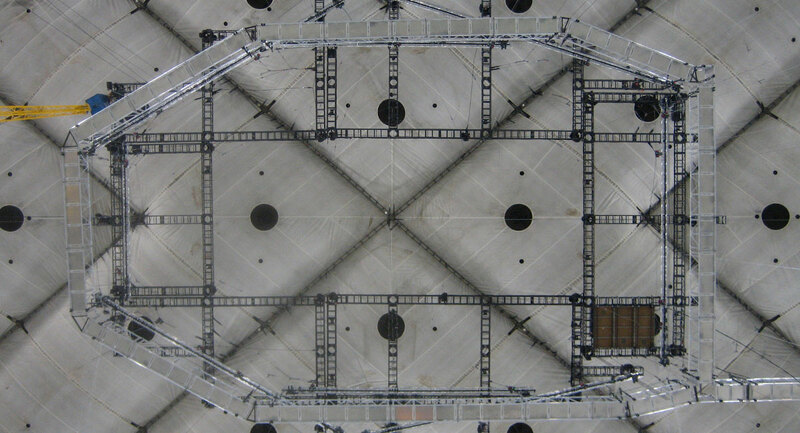 Riggit designed and built specialty components, such as a high capacity catwalk truss and flexible truss connections to compensate for some issues generated by the “breathing” of the roof. 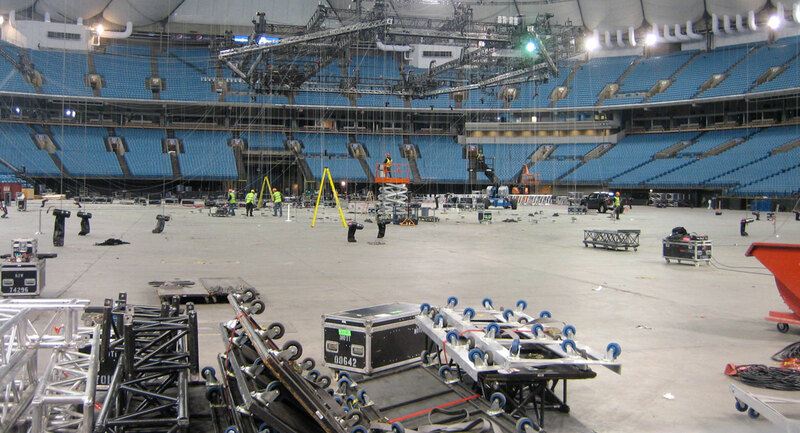 The Victory Ceremonies that took place every day between the Opening and Closing Ceremonies required an entire additional set of truss masking to be hung in order to create a kind of concert bowl within the stadium. All the challenges that Riggit faced were dealt with professionally, safely and successfully. 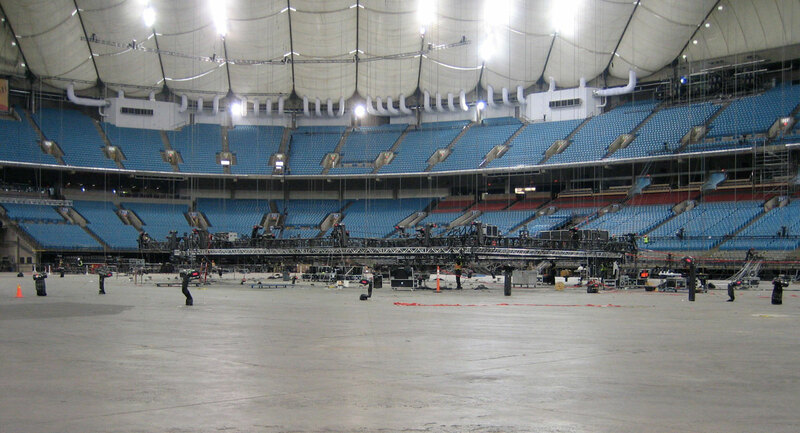 Riggit Services supplied all rigging equipment, personnel and rescue teams and hung over 7558 feet of truss, 346 electric chain motors, 12,543 shackles and over 45,000 pieces of wire rope in BC Place for the 2010 Olympic and Paralympic Ceremonies in BC Place.